Day three of our interviews with the candidates for the WORT Board of Directors continue. Today, we talk with two of the candidates running for the Supporting Member position on the board. 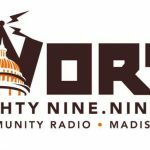 The Listener-Sponsor group consists of 4 of the 11 seats, and includes anyone who has made at least an annual, basic ($40) listener-sponsorship level contribution to WORT in the 12 months prior to the application deadline.